Kitchen! Kitchen! 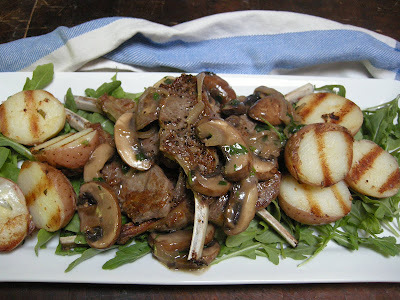 : Lamb chops.......at kitchen! kitchen! Don't you just want to devour these lamb chops right off the photo! I wish! and grilled red potatoes on a bed of baby arugula. So easy to make, that it only took me a good 20 minutes! (Serves 2 ) or 1 if you're really mad hungry! Cut in half after it has cooled and brush with olive oil - this will be grilled on a grilled pan while you are prepping the lamb chops about 3 minutes on each side just to get the grill marks. When you're ready....here comes the easy one! Sear the lamb chops on a very, very hot large cast iron skillet with a tablespoon of olive oil for 2 minutes on each side. Set aside and keep warm. On the same pan, add a pat of butter; sautee the shallots until soft, add the mushroom; season with salt and pepper, add the wine and stir for a minute or 2. Then add the flour mixture stirring constantly until well incorporated. To thin the sauce add more wine. Taste for seasoning. On a large serving platter make a nesting of the arugula; arrange the chops to your liking, add the grilled potatoes and lastly add the mushrooms sauce over the chops. Now, you're ready to devour those delicious chops!